100% Organic Virgin Coconut Flour is produced from the highest quality, selected and hand-picked coconuts. Cultivated in traditional ways, coconut palm trees grow on ecological, certified and controlled farms. The production consists of traditional ways, such as mincing of dehydrated, skimmed, raw coconut flesh. Thanks to those labor-intensive processes, Coco Farm coconut flour keeps the richness of composition and delicate smell and flavor of coconuts. 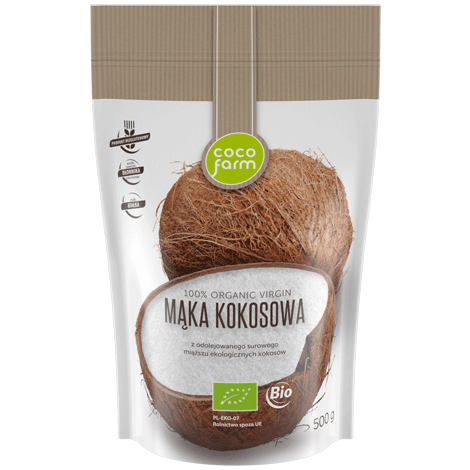 Gluten-free Coco Farm coconut flour is appropriate for the people suffering from the celiac disease. High content of fiber makes it suitable for people who use high-fiber diets. Coconut flour is perfect for baking: bread, cake, waffles, pancakes, omelette, coatings or as a soup densifier. Raw, it is a great addition to desserts, cocktails, smoothies, yogurts, muesli, salads, sauces and salad dips. In a gluten-free diet the coconut flour can be used as the only ingredient of bakings (special recipes for coconut flour) or as an addition to other gluten-free flours. In a high-fiber diets it can be used as a minimum 30% addition to a traditional flour. It is crucial to remember, however, about increasing the usage of liquids (water, milk, oil or eggs) in an amount correspondant to the added amount of coconut flour.